Perhaps one of the biggest challenges to those new to Lord of the Rings Online is figuring out all the multitude of settings available. Here is a (hopefully!) brief tutorial walking through various Options and customizable settings that will help to improve your game experience. In this guide, we will discuss specific useful settings in the following categories: User Interface, Audio, Combat, Social, Chat, Quickslots, and Key Mapping. Most settings may be edited within the game options menu. The Options menu may be accessed by pressing Esc and selecting Options from the window that appears. The User Interface, often abbreviate as UI, is the way in which all the buttons, tools and windows are arranged on the player’s screen. The UI may be rearranged at any time by the player. 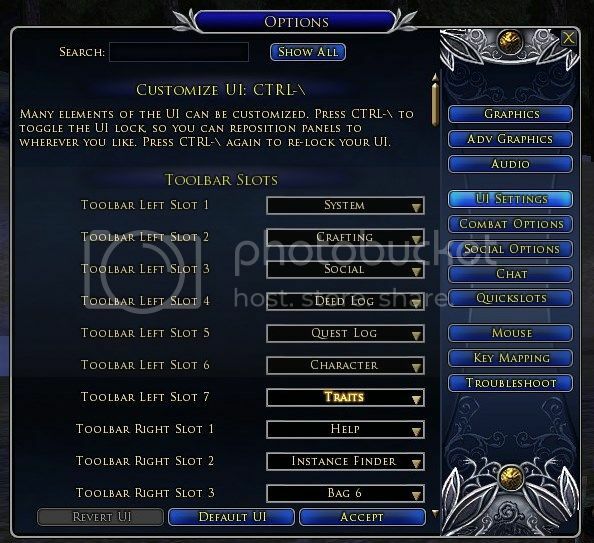 This website provides a helpful guide to the primary elements in LOTRO’s UI. To enable edits to the user interface, use the keyboard command ctrl + \. Upon using this command, your screen will look something like the below. You may then click and drag the various UI elements to arrange them as desired. To exit editing mode, repeat the ctrl + \ command. The bottom bar of the screen contains many shortcuts that may also be customized. To change which shortcuts appear, open the Options window and select the UI Settings section. There are seven shortcut slots to the left side of the quickslots containing the character’s skills and there are eight on the right. In the Options menu, these are listed from top to bottom as they appear on the bar from left to right. Use the drop down menus to alter which shortcut that appears in each toolbar slot. The game allows for aspects of the in-game sounds to be adjusted individually or as a whole via a number of bars with a sliding indicator that can be dragged back and forth. 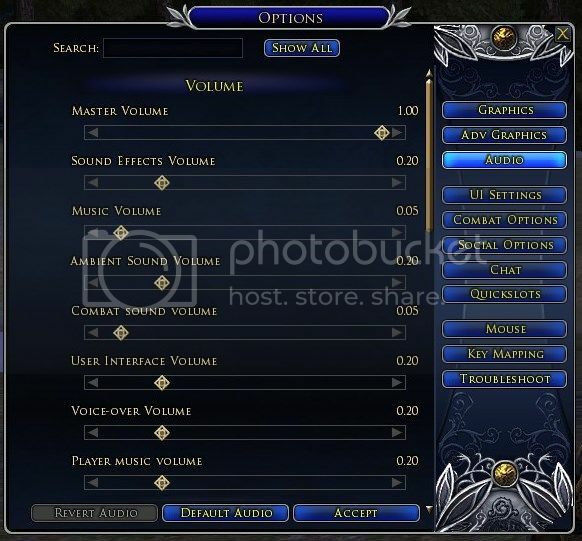 The top slider, Master Volume, controls the total volume of all the game’s other audio aspects. Each of the other bars represent audio aspects that may be adjusted individually. 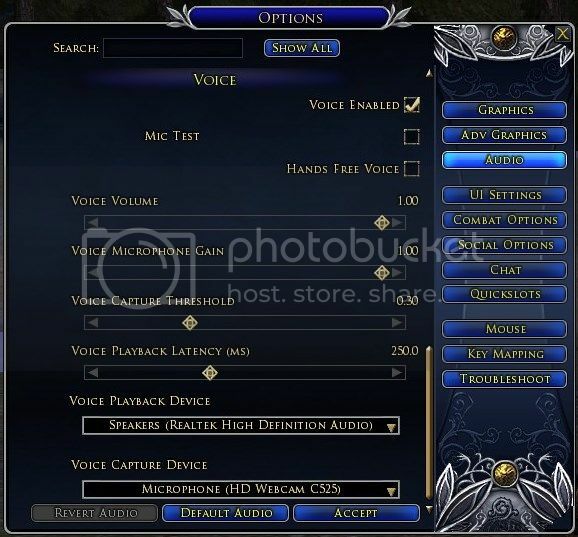 LOTRO features a native in-game voice chat system that players may enable. This feature allows players to talk to each other while in a common fellowship. To enable voice, open the Options window and under Audio, locate the check box for the setting entitled Voice Enabled. Checking the box will enable voice. If you have a microphone installed on your computer (headset, webcam, etc. ), use the dropdown at the bottom of the window entitled Voice Capture Device to select the correct microphone. Even if you do not have a microphone, enabling voice will allow you to hear others in your fellowship that do. When voice is enabled, use of the microphone is set by default on Push-to-Talk. This means that in order for player speech to be captured, a button on the keyboard must be pressed and held while the player is speaking. The default Push-to-Talk key is “z”. A later setting will detail how this key may be changed. If preferred, the box below Voice Enabled titled Hands Free Voice may be selected. This disables the Push-to-Talk functionality. Using this feature is strongly discouraged, as the in-game chat feature is not highly sophisticated and hands free voice typically results in a large amount of feedback and a chronically open mic. There are a number of settings that may be checked to provide additional information during combat. I recommend the following, which may be found under the Options window in the Combat Options section. Checking this box allows character skills to be used on the target of the character’s target. For instance, if you were to select on an ally during group play and use a damaging skill while target forwarding was active, the damaging skill would be used on your ally’s target (assuming this target is an enemy). The same is true of healing skills. If a healer is selected on an enemy, the healing skill will be forwarded to that enemy’s target, causing an ally to be healed. This setting enables an additional set of vitals to appear during combat to indicate what your target is targeting. In this example, my character is fighting a very agitated bear. The smaller vital display to the right of the bear’s vitals indicates that he is targeting me, probably to stop me from agitating him. This setting is very helpful in group situations as it allows each character in the fellowship to identify what the enemy is looking at. While a seemingly useless setting at first glance, this is again a setting that is most helpful in group settings. A combat state break occurs when a stun or similar crowd control (CC) technique has been ended by damage. This setting causes a notification to appear in the player’s chat window indicating the character who inflicted damaged on the controlled enemy. This helps a group to identify and coach those who might be breaking up a strategic element in the fight. I strongly encourage characters with strong crowd control skills such as Lore-Masters, Burglars, Hunters, and others to have this setting enabled. Checking this setting causes the Raid Assist Window to appear on the player’s screen when a Fellowship Assist Target has been specified. This is a very important window during group play. Use this window to select key individuals in the party or to select their targets. This window is often used to help group members to target the same enemy when fighting in a group. The first of the next two settings is usually considered a combat setting, but because it appears under the Social Options section of the Options window, we will discuss it here. 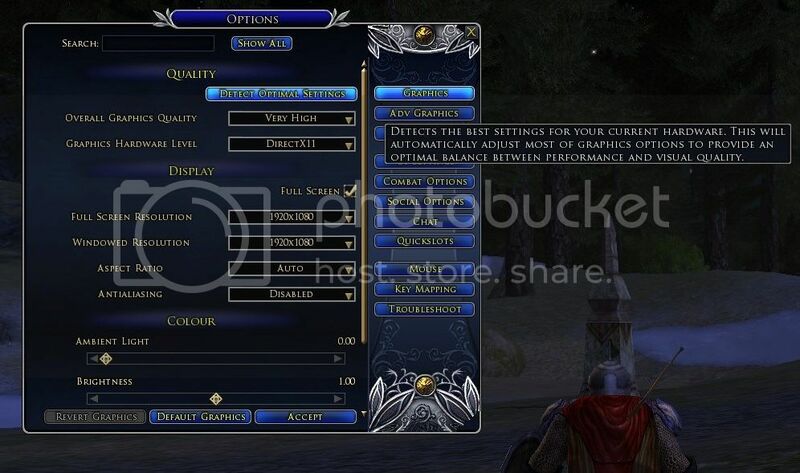 Checking this box will cause only those effects which may be removed via a potion or skill to appear under the vital bars of other characters within a fellowship. I encourage all players to enable this setting, but especially healers, as a large stack of other buffs may make the morale bars of the fellowship difficult to see. Checking this box will cause the cosmetic pets of other players to be hidden to you. Use this if seeing other people’s chickens and shrews irritates you. There are a number of customizable elements in the chat window. Rather than explain all of these myself, I will refer to this website, which does an excellent job explaining how to adjust the chat window settings. One may also change the color of the text for certain chat channels as desired. In the Options window under the Chat section, find the chat channel desired and move the square about the color grid to select a new color. The text of the chat channel name will change to provide an example of the end product. While few may have reason to utilize this option, all chat tabs including IM sessions have the option for chat logging. 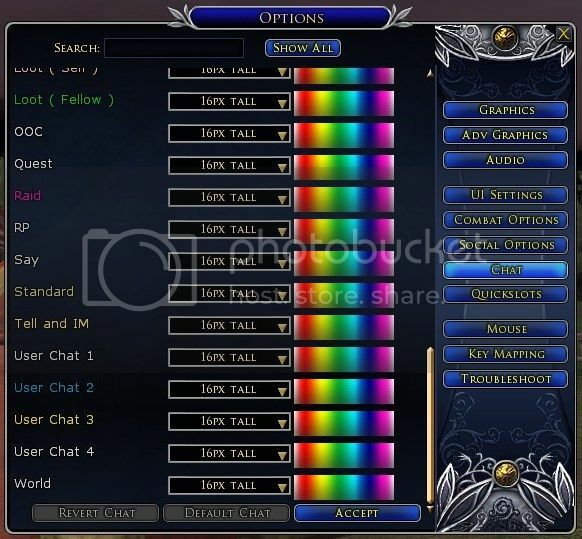 This option will capture all available chat history and save it as a text file in the default locations, usually My Documents > Lord of the Rings Online. To capture chat with chat logging, right click on the tab containing the text you wish to log, and select Capture Chat. You may then refer back to the text file later. This is not a common feature, but one I think important. While most people likely use this to capture and analyze combat details, it is also important for capturing critical discussions. I have saved chat in cases where there appeared to be an infraction of the Turbine Terms of Service or Code of Conduct, or if there inappropriate or offensive behavior is exhibited. This option may come in handy in the (hopefully) rare cases where another player must be reported to Turbine GMs. I also encourage newer players to use this to capture chat where detailed advice has been given so the instructions can be reviewed at a later time. 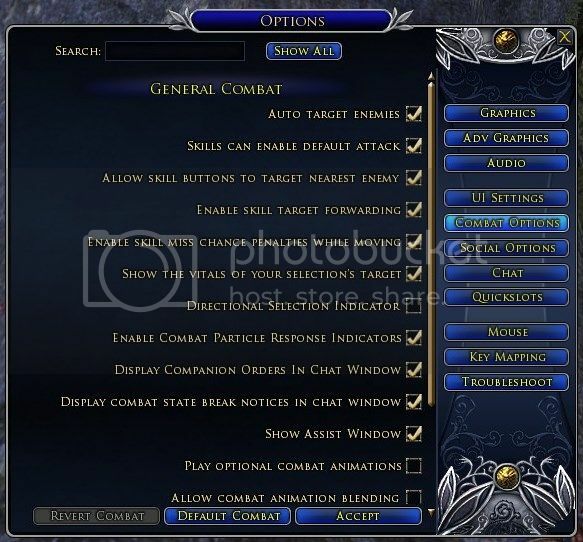 The default quickslots appear in the middle of the bottom bar and contain the character’s skills. Up to two more bars of quickslots may be displayed and all quickslot bars customized under the Quickslots section of the Options Window. Docking a quickslot bar will cause it to stack with other bars in the default location in the center of the bottom bar on the screen. Docking a bar automatically sets its orientation as horizontal. Additional quickslot bars that are not docked appear in the vertical orientation by default, but may be set as horizontal by checking the box to Make Bar x Horizontal. 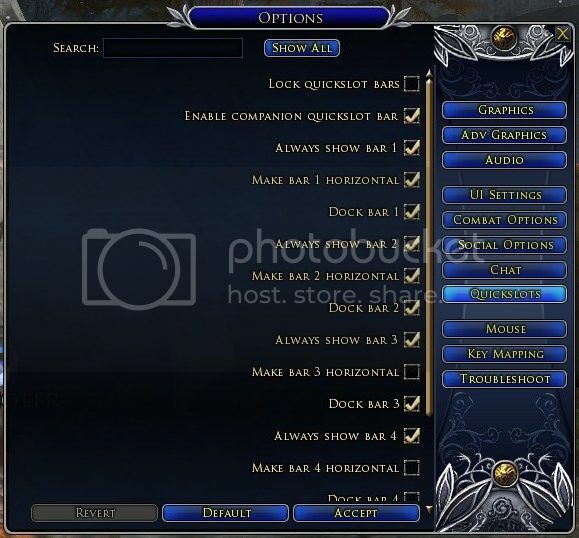 To lock the contents of a quickslot bar, check the box titled Lock Quickslot Bars. This prevents skills from being inadvertently dragged out of their quickslot. Quickslot bars may be moved around the User Interface by using the ctrl + \ command introduced above. 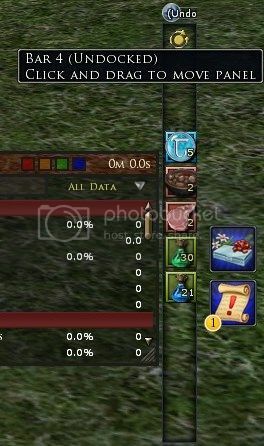 Here is an example of how I use my fourth quickslot bar to hold my character’s consumables. Note that only quickslot bars that are undocked may be moved around the screen. 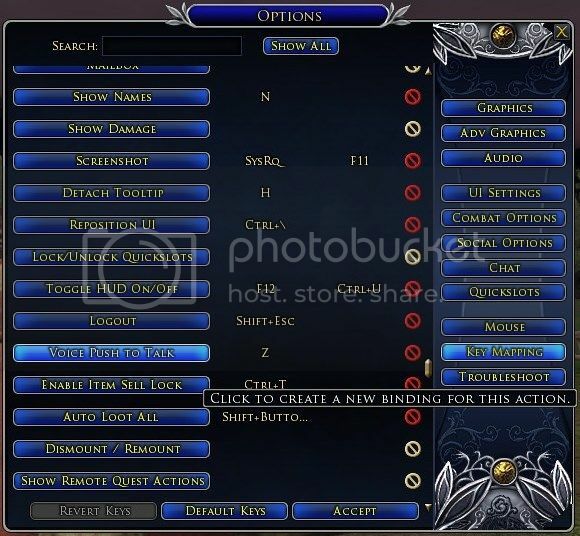 All of the game’s default keyboard controls may be edited under the Key Mapping section of the Options window. This section is extensive, and I would advise most players not to meddle too much with the game’s default key mapping choices. However, I have shown where the key control mapping for the voice push-to-talk may be edited as many players may want to change the default key from “z” to another key which is easier to reach on the keyboard. At the very bottom of the section for Key Mapping is a setting titled Toggle Target Lock-on Mode. The default key binding for this particular feature is “x”. Players who find their camera inexplicably turning toward their selection more than likely have pressed “x”, thus enabling this feature. Some players prefer to remove the key binding for this particular feature in order not to accidentally enable it. For anyone who has had connection issues, this setting will help to assess the strength of the internet connection to game servers. This option may be found a little over halfway down the UI Settings section of the Options window. Checking the box titled Show Connection Status will cause a small box with the illustration of a piece of linked chain to display, indicating the connection strength. This box may be moved using the UI editing command ctrl + \. Please feel free to provide suggestions of important settings I have missed or help clarify those listed here! I want this to be as useful of a guide as I can provide. One addition I would suggest under combat options is to use the the Combat Directional Indicator. This provides a dotted link pointing at the target, which is not only useful to see where your target is in combat, but when you are questing and searching for hard to find items on the landscape, you can select nearest item and instantly see where it is. I also made a guide – few things i mentioned is already well described by Ashi. A little help with commands, settings and starter pack to make your playtime better! As far I know these work 1x / account / IP adress. 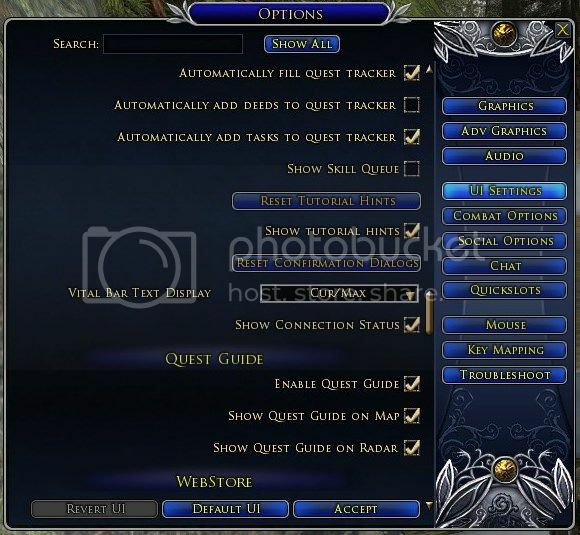 Free LOTRO starter pack (while keys last). Has Riding skill, Chestnut horse, cosmetic armor, plus boosts - for all chars on account (current and future). I didn’t find a giveaway today. 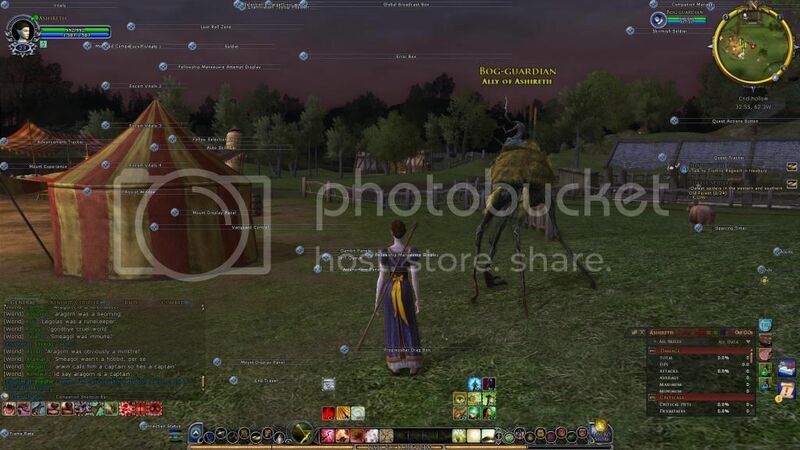 Time by time google „free lotro starter pack” there is almost all the time a site that gives away keys. 1., Log out of the game. 4., Copy the Key you received in e-mail in the Product Key field. 5., Submit, log out and enjoy! RAID SETTINGS for less lag ! 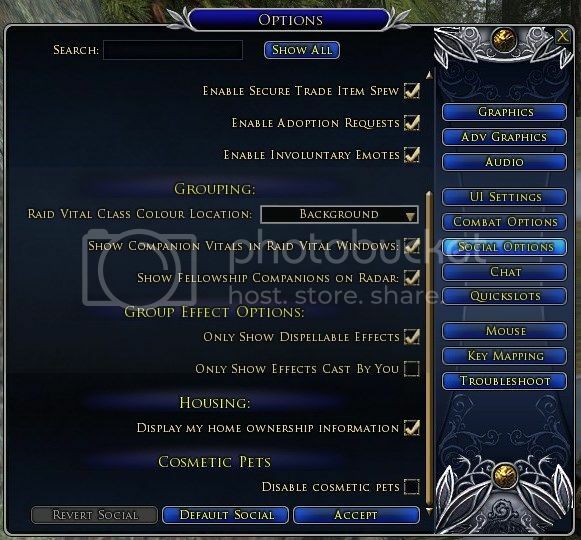 I played lotro for 2 years on wooden pc and still not on a gamer pc, so i use these settings aswell. The first thing you can do is turning down your overall graphic quality. I didn’t mess with this a lot but unchecking all the Lightning, Shadows, and Post Processing settings might be helpful. To be able to hear fellowship members talking, scroll down to Voice and check voice enabled. Make sure that at Sound Features, Voice Playback Device and Voice Capture Device the right (and same) device is chosen (it is possible that your pc offers more). When i’m in a fellowship or raid, i mute music and turn lower sound effects, ambient sound volume and combat sound volume. If you use a headset, you have to plug it in BEFORE you start the game! I leave unchecked all the floating damage and experience settings. Now this is where you can turn off a lot of lag! Enable Skill Target Forwarding – Adding to what Ashi wrote, I noticed that this setting is used to turn your character to face target. It saves from so much trouble when the enemy is behind your back, you target it but can’t attack! Show the vitals of your selection target – it’s especially useful for tanks. You can see who has the aggro. Definitely have checked Show Assist Window. You can have the last 4 boxes unchecked, except if you are melee, useful to have on Enable Movement Assistance in Combat. But careful! You want to turn it off in areas where it matters where you step, f.e. Urugarth instance (puddles kill you) or when you’re fighting an enemy with (melee) reflect. Thanks for adding all that useful info, Eth! By the way, the weird characters that were at the beginning your original post were apparently caused by cutting and pasting the text from Microsoft Word .. which I do too when I'm writing a long post. I edited the source code of your post (using the "<>" button on the edit menu) to get rid of the weird characters, so now hopefully it looks as u intended it. Yay, thank you very much, Bri! I was looking for the html tab but didn't find it.